^ Kury, Adriano B. Classification of Opiliones. www.museunacional.ufrj.br. [2017-11-29]. ^ 2.0 2.1 2.2 2.3 Glauco Machado, Ricardo Pinto-da-Rocha & Gonzalo Giribet. 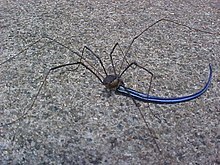 What are harvestmen?. (编) Ricardo Pinto-da-Rocha, Glauco Machado & Gonzalo Giribet. 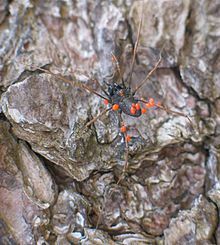 Harvestmen: the Biology of Opiliones. Harvard University Press. 2007: 1–13. ISBN 0-674-02343-9. ^ 3.0 3.1 3.2 延陵動物志(蛛形動物) / FAUNA NGIANA (ARACHNIDA). 延陵科學綜合室. [11 October 2018]. ^ Garwood, Russell J.; Sharma, Prashant P.; Dunlop, Jason A.; Giribet, Gonzalo. A Paleozoic Stem Group to Mite Harvestmen Revealed through Integration of Phylogenetics and Development. Current Biology. 2014, 24 (9): 1017–1023 [April 17, 2014]. PMID 24726154. doi:10.1016/j.cub.2014.03.039. ^ Garwood, Russell J.; Dunlop, Jason A.; Giribet, Gonzalo; Sutton, Mark D. Anatomically modern Carboniferous harvestmen demonstrate early cladogenesis and stasis in Opiliones. Nature Communications. 2011, 2: 444 [June 8, 2015]. PMID 21863011. doi:10.1038/ncomms1458. ^ Fowler-Finn, K.D. ; Triana, E.; Miller, O.G. 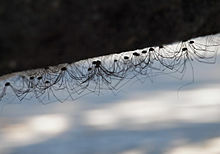 Mating in the harvestman Lieobunum vittatum (Arachnida: Opiliones): from premating struggles to solicitous tactile engagement. Behaviour. 2014, 151 (12–13): 1663–1686. doi:10.1163/1568539x-00003209. ^ Machado, G.; Raimundo, R. L. G. Parental investment and the evolution of subsocial behaviour in harvestmen (Arachnida: Opiliones). Ethology Ecology & Evolution. 2001, 13: 133–150.